These beautiful Malas are strung with 3mm or 8mm natural aromatic Sandalwood beads. Exotic Sandalwood is one of the oldest perfumery materials. It is mentioned in the Nirukta, vedic commentary of Kautila Aarthasastra 4th century BC, among other ancient books. The sweet aroma is compared to the closest scent here on Earth to the Gardens of Heaven. The scent that is left on your skin while wearing the malas and counting prayers is said to bring you closer to your teacher or Guru. Sandalwood is used in Buddhist and Hindu ceremonies. It is said to heighten awareness in meditation.Prasad denotes the mental state of generosity. When it is offered to a Deity, it is given as Prasad, a blessing that mala then has in it the qualities of the Deity. 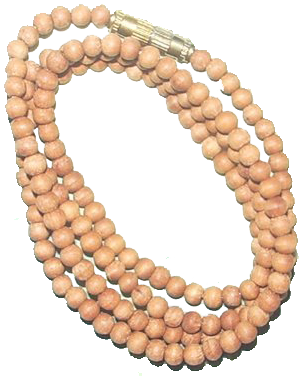 3 mm beads pictured here are made with the same high quality Sandalwood beads. 3 mm Sandalwood 18″ necklaces have a screw clasp and are great everyday, everywhere beads. These smaller beads can stay on day and night. 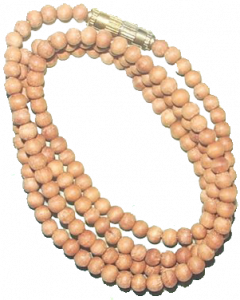 The natural aroma of the beads keep you close to your Teacher and Guru for as long as you are wearing them. This quality of Sandalwood retains its aroma for years. It is #1 quality. Because Sandalwood is a natural material, it will also have some variations in color. Save by buying in Bulk! Great for gifts! To purchase our products at wholesale prices or in bulk, please contact us with your tax id and products you would like to purchase.